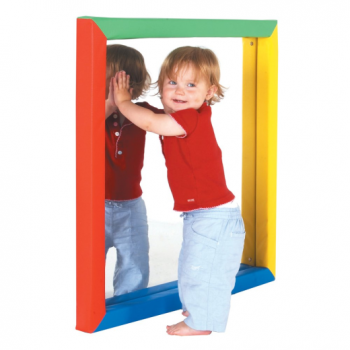 Soft Frame Mirror (Large. 850mm)* - This BIG mirror with wipe clean soft framed matches our soft frame moulded “bubbles” mirror. 850mm square is made with HAMMER TOUGH, non-shatter safety plastics. If using in the baby room mount at ground level, soft frame is safety padding and not designed as an aid to help babies pull themselves up to standing. Phthalate free, fire retardant fabrics cover fire retardant foam. With wooden back. Mounting plates provided but not wall fixings. Use mounted on a wall. Indoor use only.